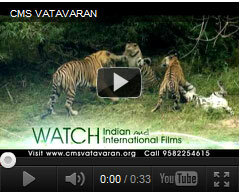 A warm welcome to the 7th edition of CMS VATAVARAN, the premier Environment and Wildlife Film Festival and Forum from India that is making a global impact, scheduled for 04-08 December 2013 in New Delhi. Entries invited for 11 Indian and International CMS VATAVARAN coveted awards. Entry deadline is May 31, 2013. Prize money ranging from INR 50,000 to INR 1, 50,000 in Indian Categories. So you missed the regular entry deadline to submit your film! Now what? Commemorating its decade long eventful journey, CMS VATAVARAN invites you to host Green Film Screenings at your campus. We encourage you to use film as a powerful tool to promote environmental responsibility among your friends, family, partners, colleagues and network.